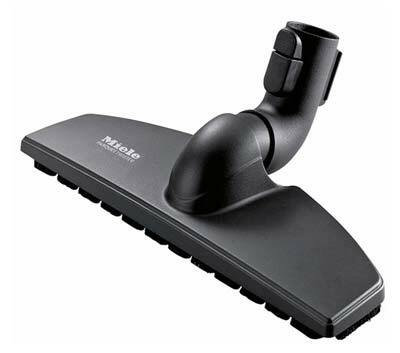 Best Rated Miele Vacuum Cleaners Comparison & Reviews – This is a roundup of the best rated Miele Canister and Upright vacuums currently available. Miele is a premier, German engineered vacuum made with the best materials for long life. 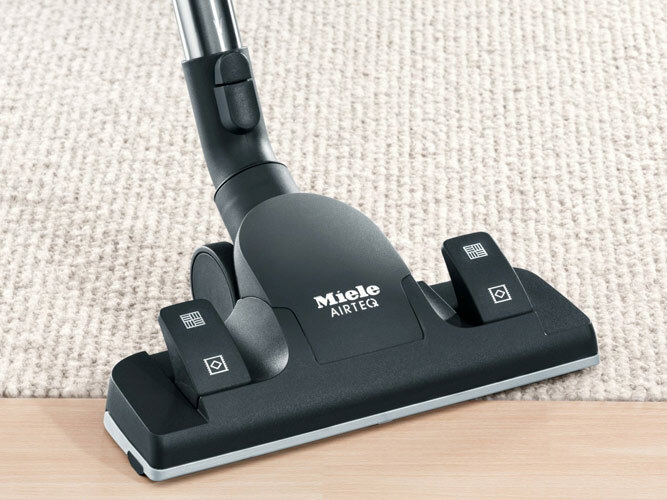 Miele vacuums have always received the highest consumer reviews in both canister and upright vacuums. Miele vacuums are also engineered to be quieter than other brands with the ability to adjust the amount of power. Miele created the world’s first HEPA certified vacuum. 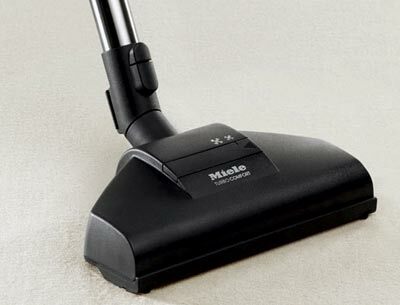 All Miele bagged vacuums use self sealing bags, to keep the dust in, when you remove them from your vacuum. With strong suction, Miele vacuums are great for pet hair removal. If they fit your budget, we highly recommend this brand of vacuums, as they will outlast many cheaper vacuums. 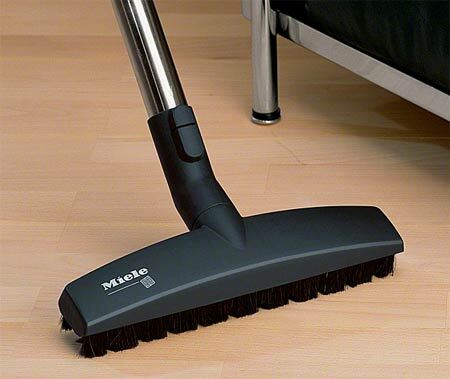 Miele canister vacuums with strong suction, non marking rubber wheels, and parquet wood floor brushes are especially suited for hardwood floors. All Miele vacuums either have HEPA filters, or have the option to buy them. Miele vacuums are tested for 20 years of usage. 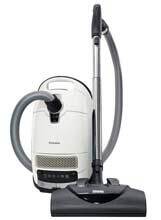 Below are the top Miele 2018-2019 canister and upright vacuums listed to compare features and model differences, price and reviews in the comparison chart below. VIDEO: Miele Bagged Canister Lineup for 2019. 12-stage AirClean Sealed™ System = The Miele C3 Complete Canister series uses a totally sealed 12 stage filtration system with HEPA Filter to clean the air you breathe. It is Miele’s best filtration system. Captures 99.9% of particles. These are Miele’s best Canister Vacs. Engineered to be Quieter = Miele vacuums are engineered to be quieter in operation. 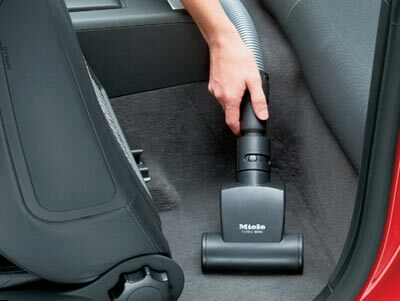 In addition all Miele vacuums have the ability to increase or lower power. Bagged Canisters have 6 power settings, allowing you to lower the noise level even more, and to vacuum delicate rugs, or use the hose to vacuum drapes. Miele Durability and Longevity = Miele vacuums are constructed from high quality materials, and have been German Engineered to last 20 years. Miele testing simulates 20 years of in home use. 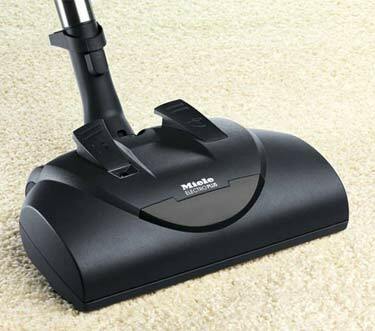 Miele are among the highest rated vacuums sold today. Miele’s New CX1 Blizzard Bagless Canisters = Miele for 2018 has introduced its first bagless canister vacuums. They are called the Blizzard CX1 series. They have all the great features of the regular Miele bagged vacuums, but require no bags, and have an easy to empty dust bin. The models available are the Blizzard CX1 Turbo Team Canister, the Blizzard CX1 Cat & Dog Pet Canister Vacuum, and the Blizzard CX1 Electro+ Canister. All of the CX1 canisters come with Lifetime HEPA filters. Electric Hose = Some Miele Canister vacuums have an electric hose that has electrical power available for electric powered floor tools with motor driven brushes, suitable for deeper pile carpets. 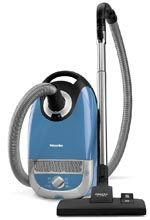 Hardwood Floors = Miele canister vacuums are especially suited for hardwood floors. Miele vacuums have high suction, rubber wheels that won’t scratch floors. 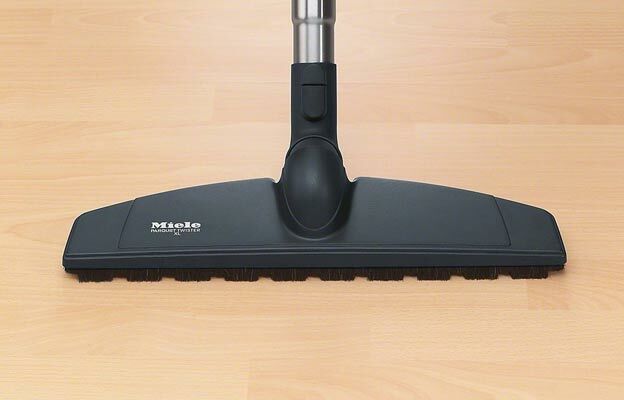 Many Miele canisters come with a Parquet Hardwood Floor Brush, with soft bristles, that won’t mark your floors. Pet Hair Removal = Miele vacuums have strong suction and are ideal for pet hair removal. 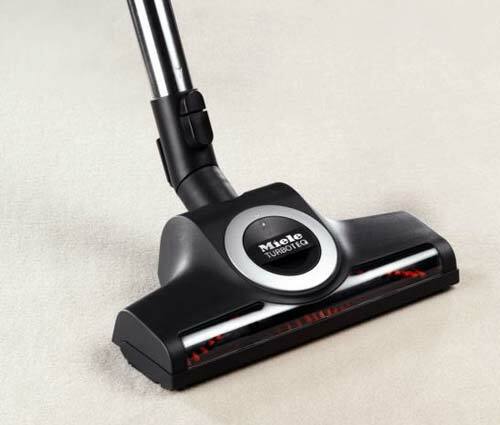 With an air or electric driven brush head, Miele vacuums are also suitable to remove pet hair from carpets and rugs. Miele’s filtration system will capture pet dander to prevent you from breathing in allergens. Soft and High Plush Carpeting = Soft carpeting will present a problem with many vacuums, as the suction will form a seal with the extra dense carpet and make is hard to push the vacuum smoothly over the dense carpet. 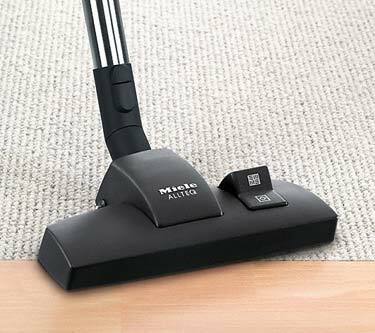 Miele vacuums have been recommended by Soft carpet manufacturers. Some soft carpeting brands are SmartStrand Silk, Caress®, Karastan, and Soft Spring. 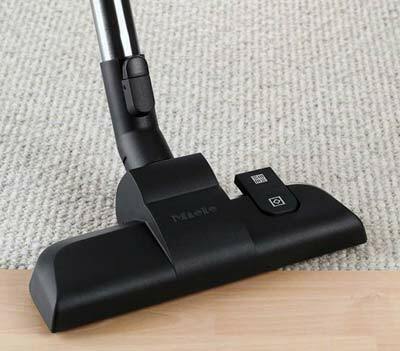 Miele has three models that come with the carpet manufacturer recommended SEB228 electric floor/carpet tool which is ideal for Soft and High Pile Plush carpets. These models are the Miele Cat & Dog Canister, Miele Kona, the Miele C3 Soft Carpet Canister and the Miele Compact C2 Electro+ Canister, and the Miele Blizzard CX1 Cat & Dog Bagless Canister Vacuums. Miele C1 vs. C2 vs. C3 Series Canister Vacs = The main differences between the C1 vs. the C2 & C3 Series is that the C2 & C3 Series has an AirClean Sealed system, a step above, using more gaskets to seal the whole system. (The C2 and C3 Series also has new lower-noise, Vortex Motor™ ). The other difference between the series is the size of the canister. The C1 is compact, C2 is mid-size, and C3 is full-size. The C3 is different from the others in that it has a 12-stage AirClean Sealed™ System, which is not found on the other vacuums. Compare features in the comparison chart above. Miele model differences = Within each model group, for example the C1 series canister vacs, the main vacuum unit is identical. The difference within each model group is the color, the included accessories, the filter type included. Another difference is whether the wand is electric or not. An electric wand will transfer electricity to the powerhead for a motorized floor tool (better for carpets). These are the main differences among Miele vacuums in the same series range. Power Settings = All Miele vacuums allow you to adjust the suction power of their vacuums by controlling suction motor speed. This is most useful for vacuuming delicate rugs, drapes, and fabrics. Many other vacuums give you limited or no control of suction power. Whisper Quiet = Miele vacuums are designed to be quieter than other brands of vacuums. They are sound insulated, and have variable speed suction motors that can be reduced so as not to disturb others, and your pets. Miele are some of quietest vacuums on the market. Bagged Vacuum = Most Miele vacuums use dust bags. They self seal when you remove them from the vacuum so you don’t have any dust flying around. A 9 layer filtration system is built-in to the bag. 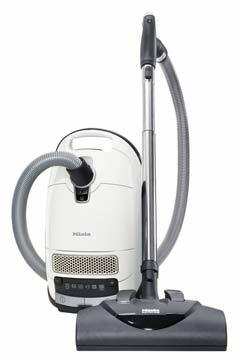 Bagless Vacuum = The new CX1 Blizzard series of Canister vacuums from Miele are their first bagless canister models. Easy emptying of the dust bin and a new Vortex technology to remove dirt, with a Lifetime HEPA filter. HEPA Filter = All Miele Vacuums can have a HEPA filter. Some come pre-installed with a HEPA filter. A HEPA filter is best for those with allergies to dust and dander, especially if you have pets. HEPA filters will remove the smallest particles of dirt, dust, and pet hair so that you don’t breathe in what you are vacuuming. Active AirClean Filter = Miele Cat & Dog Vacuums (both upright and canister), use a special filter with activated charcoal to trap pet odors, and output clean air when vacuuming, which is the best filter to use if you have pets. AirClean Sealed System = This sealed system contains dirt and dust from escaping any area of the vacuum with gaskets. This feature is only available on the Miele C2 and C3 canister series and the U1 upright series. Handle Brush Control = Those vacuums with an electric hose, have a convenient control built-in to the handle to turn the beater brush on and off. 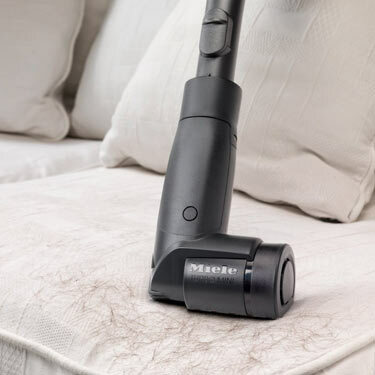 Extension Hose = All miele uprights have an extension hose, which allows you to vacuum not only the carpet or floor, but to vacuum upholstery, drapes, stairs, and walls. 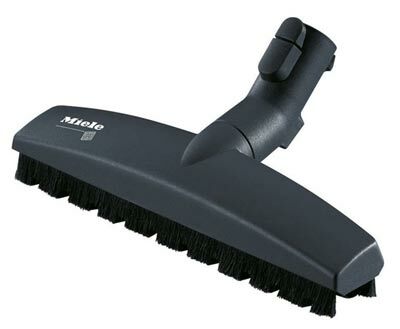 Mini Turbo Brush = The Miele Cat & Dog Upright includes an air driven mini turbo brush tool to vacuum upholstery, car seats, and other areas. This is especially useful for removing pet hair. 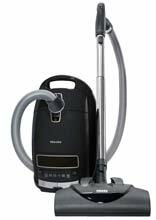 Also available on the Miele Cat & Dog Canister pet vacuum. 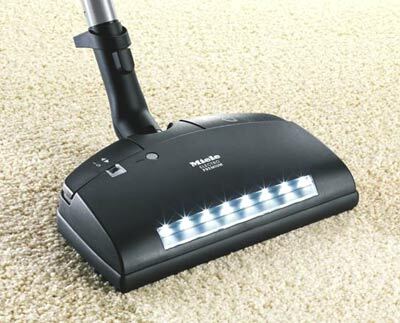 LED Headlights = Certain models of Miele Uprights (Jazz, Cat & Dog, Swing) have a built in LED lighting system to see the dirt and dust you are vacuuming. The Miele UniQ and Marin canisters have a floor tool with headlights. 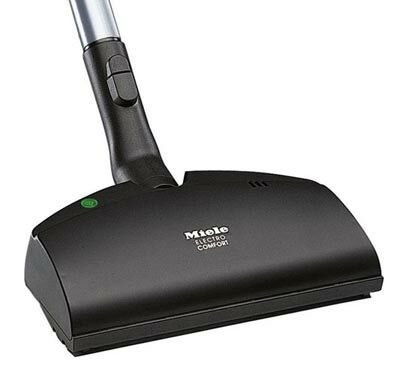 Stainless Steel Wand = Miele Vacuums use stainless steel for their wands, and not cheaper metals seen on other brands, for long-term durability. Differences between the C3 and S8 Series Miele Canister Vacuums = The only real difference is that the S8 is last year’s model, and the C3 is this year’s model. No major differences, they are virtually identical canister vacuums. Both are full size canisters. Miele Tested for 20 year life = Miele vacuums are tested to last 20 years, for long-term durability. Swivelneck™ = Miele uprights have the Swivelneck™ feature so that they can maneuver better than most uprights around walls, and furniture. Miele uprights can also lay flat to the floor to get under tables and furniture. Micro Tool Set = The Miele Swing Upright comes with the Microset SFD20 tool set for cleaning delicate items, such as inside computers, artwork, etc. These miniature vacuum tools will fit in areas traditional brushes cannot go. The Miele Swing also comes with a flexible crevice tool that bends around corners. Differences between the U1 and S7 Series Miele Upright Vacuums = The models in both of these series are identical, only the model numbers have changed. The S7 was the previous model, and the U1 series is the current model. SBD285 Floor Tool – For low pile carpet/smooth floors, hardwood, comes standard with Ariel and Quartz Canisters. STB205-3 Turbobrush – Air driven brush, cleans low/medium pile carpet, pet hair, and hardwood/bare floors. SEB228 Powerbrush – This floor tool has an electrically driven motorized 14″ brush. This makes this suitable for low to high pile carpeting, pet hair, bare/wooden floors. Recommended for Soft Carpets by Carpet Manufacturers. This floor tool comes standard with the Miele C3 Cat & Dog Canister and the Miele C3 Soft Carpet Canister. SEB236 Powerbrush – This floor tool has an electrically driven motorized 13 3/8″ brush with headlights. This makes this suitable for low to high pile carpeting, pet hair, bare/wooden floors. SEB217 Powerbrush – This floor tool has an electrically driven motorized 10 1/2″ brush. This makes this suitable for low to medium pile carpeting, pet hair, bare/wooden floors. Parquet Twister SBB 300-3 – This tool is ideal for hardwood and bare floors. Soft bristles won’t scratch floors. 90-degree rotation great for cleaning around obstacles such as table legs and in tight places. SBB Parquet-3 Brush – This floor tool is ideal for hardwood and bare floors. Soft bristles won’t scratch floors. SBD 350-3 FiberTeQ Floor Tool – For smooth flooring and low-pile carpeting. Standard with Miele Olympus Canister. Click the rocker switch to change from smooth floors to carpeting. STB 101 Handheld Turbo Brush – Available on Cat & Dog Vacuums (canister & upright) to clean smaller areas such as your car, stairs, and upholstery. Will pick up dirt, dust, and pet hair. Tool is air driven.